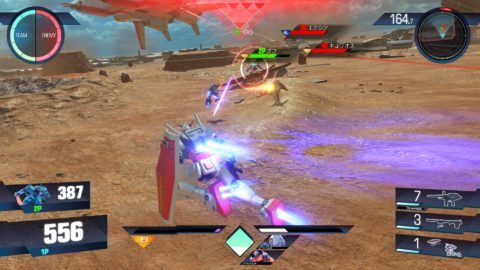 Bandai Namco have recently announced that Gundam Versus for the PS4 will be releasing on July 6, 2017 in Japan. This will include a normal edition and Premium G Sound edition release at a price of ¥8,200 and ¥11,000 respectively. The Premium G Sound edition will feature 35 extra tracks that include Just Communication from Gundam Wing and Orphans no Namida from Iron Blooded Orphans. Hot Scramble Gundam, which was recently added to EXVS Maxi Boost ON, will also be part of a pre-order campaign until July 5th as well. We’re pretty excited to see the game releasing a lot sooner than expected! Check out the release trailer below, which is probably the game’s intro, and let us know what you think! Well, if you were wondering if Build Fighter units were ever going to join the EXVS stable, here is your answer. 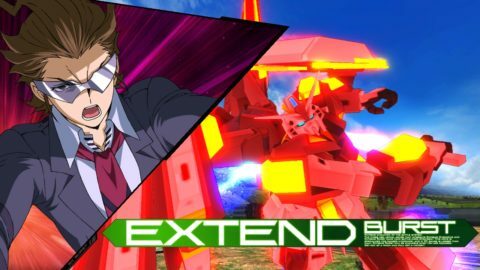 Meijin Kawaguchi the 3rd’s Hot Scramble Gundam from the Gundam Build Fighters AR (Amazing Ready) manga has entered the fray. Just as ostentation as its design and pilot, Hot Scramble Gundam is set to dazzle with its array of fantastic attacks. 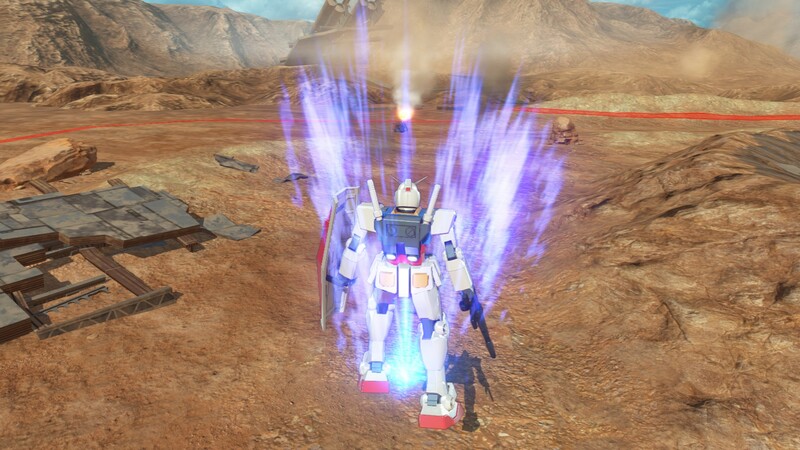 As a 3000 cost unit, it has flashy funnel attacks, controllable gerobis, and a souped up wave rider burst attack courtesy of its Zeta Gundam foundation. Hopefully we’ll get to see it in the PS4 version of Gundam Versus, too. Until then, check out the trailer video below and let us know what you think! In their latest issue, Famitsu has announced some rather expected additions to the upcoming Gundam Versus for the PS4. Returning from the previous Extreme Versus series are the Gouf Custom, Freedom Gundam, GP02A, F91, and the G-Self. This brings the confirmed roster to over 40 units currently. And for those who weren’t able to get into the closed beta last week like myself, check out some of the videos below for some awesome gameplay from Arcade, Versus, and Survival with old and new units like the Jesta, Union Flag Custom, Throne Zwei, and many more! The entry period will run from February 16th to the 28th. Purchase the free ticket from the link provided with your JP PSN account and be enrolled in a lottery. 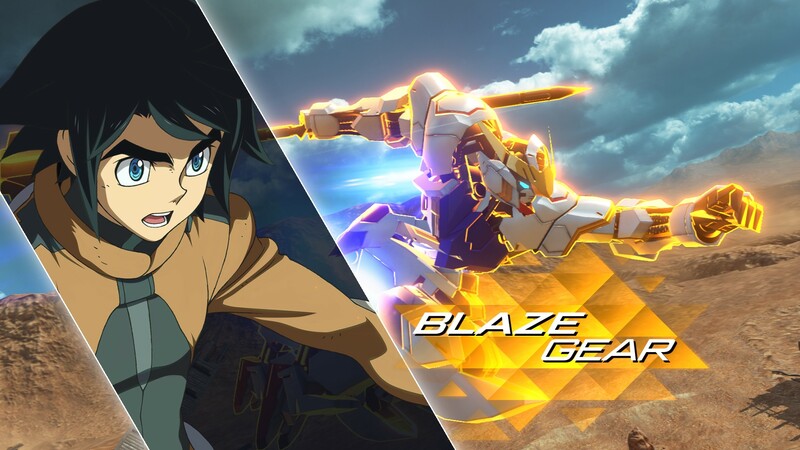 If you are chosen, you will receive an email on March 9 from Bandai Namco with the product code to download the closed beta. Good luck to everyone that enters and hopefully see you on the battlefield! 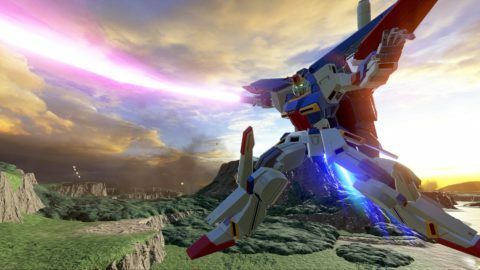 Bandai Namco have announced they’ll be holding a closed beta for Gundam Versus in March 2017. It’ll be held in Japan, Taiwan, Hong Kong, and South Korea. While details are still unknown as to how to enter, more info will drop on the official twitter account. Here’s to hoping entry is not similar to the closed alpha they held last year in their Japanese branches. On the gameplay front, new footage has come from the 2017 Taipei Games Show this weekend. 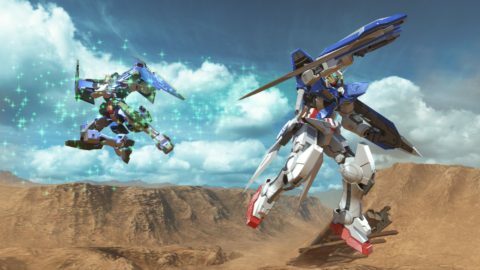 Units such as Zeta, ZZ, V2, GN-X, and the Overflag were confirmed playable and can be seen in the video below. Aside from that, there were some nice quality of life changes with the HUD including your selected Striker indicator is now moved from the bottom of the screen to above your weapon loadout. 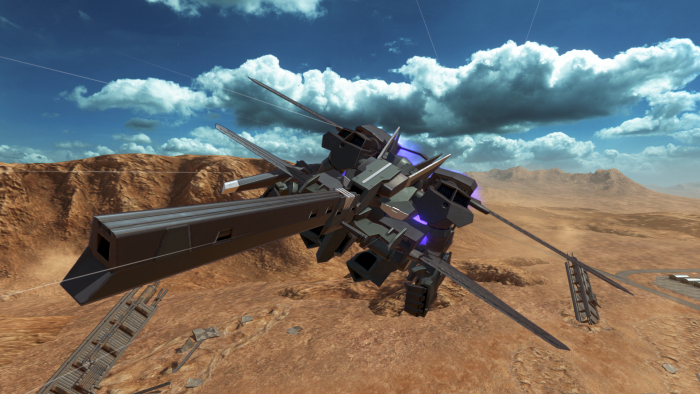 Also, it confirmed other units as Strikers such as the Hyaku Shiki and Gundam Dynames as mentioned before. As always, we’ll keep you updated as soon as more information drops. Until then, check out the stream footage from the Taipei Games Show below! Jerid Messa’s final mobile suit from Zeta Gundam returns to the VS series in Gundam EXVS Maxi Boost ON. Last playable in Gundam VS Zeta Gundam, the Baund Doc touts the transformable gameplay as seen from many of the Zeta suits and mobile armors. You’ll be wanting to switch between mobile suit and mobile armor mode constantly to take advantage of its mobility and weaponry, similar to how the Hambrabi is played. As a 2500 cost unit, it’ll be packing a bit more firepower in its gerobis as well. Check out the teaser video below! 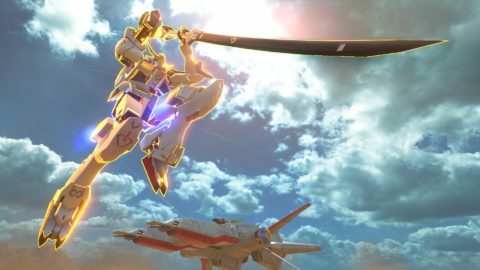 Hot off the presses from the Gundam Games 30th Anniversary stream comes the first gameplay footage from the Gundam Versus alpha test! 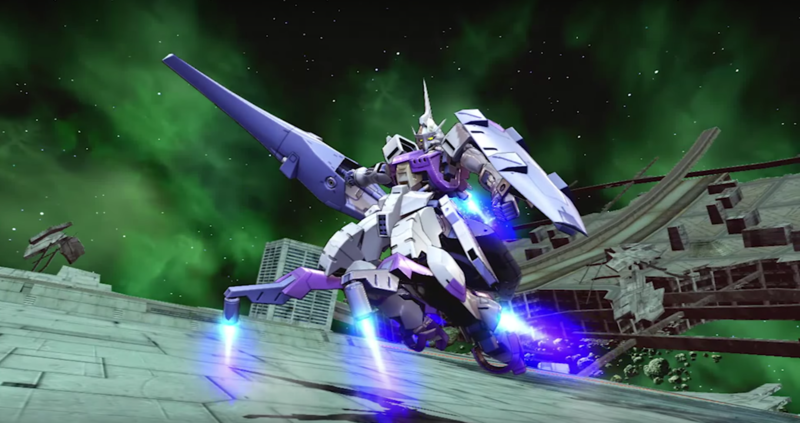 The game looks functionally like the EXVS series that came before it, but of course new techniques like the Boost Dive stand out. 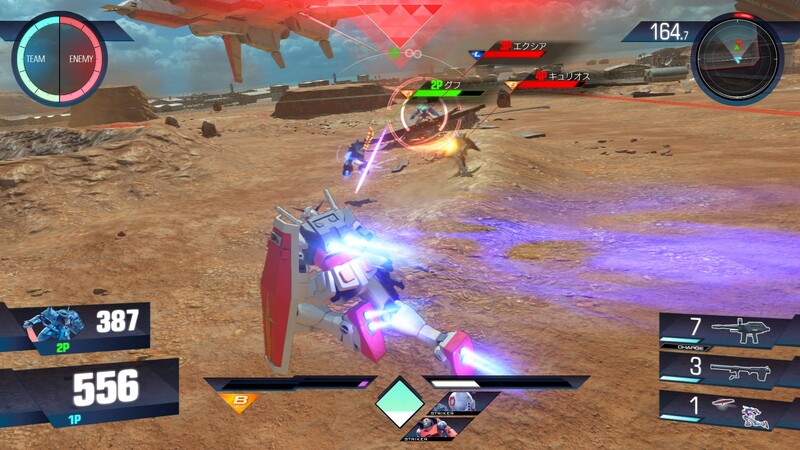 The first match has RX-78-02 and the Gouf versus Exia and newcomer Kyrios, whereas the second match features Full Armor Gundam (Thunderbolt) and Wing Zero TV versus Sinanju and Guncannon. 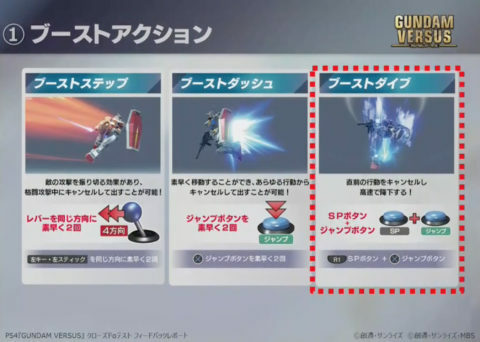 A new button has been added to activate the new Boost Dive and Striker functions, the SP button. To activate the Boost Dive, simply hit SP + Boost while in the air. 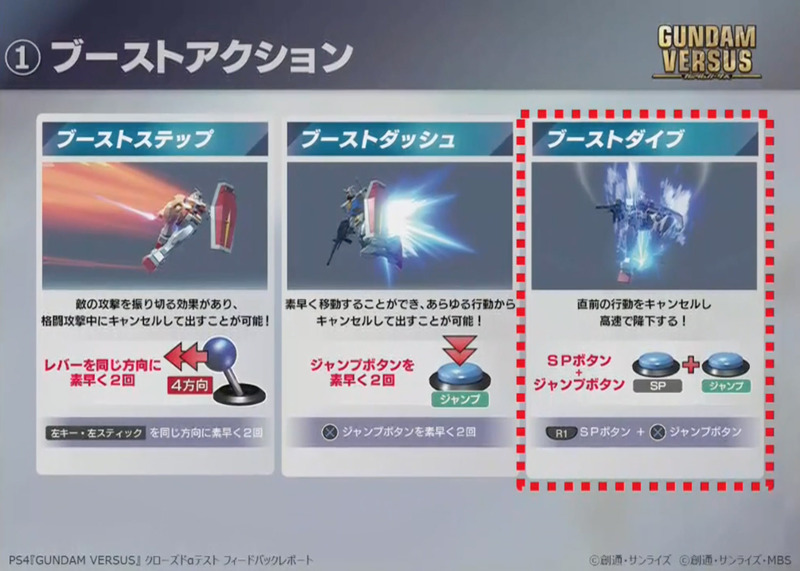 To activate you strikers, hit either SP + Shoot for Striker 1 and SP + Melee for Striker 2. Activating your awakenings is still the same from the EXVS series where you hit Shoot + Melee + Boost. To perform your Awakening Technique, have your gear activated and hit the same three buttons again. The new Boost Dive technique is similar to the normal Boost Dash in that it allows the cancelling of any move as you dash down towards the floor. But it does have its fair share of caveats. First, Boost Diving consumes a lot more of the boost gauge than boost dashes and step cancels. It also doesn’t cut tracking like step cancelling and has a large recovery. Needless to say, it’s still a great new mobility option that can definitely help increase your lifespan on the battlefield. The new Striker system was also in play during the matches. The Striker bar fills automatically once the match starts and will carry over after a death. Once a Striker is called upon, the gauge will deplete and not refill until the Striker has finished their attack. When the bar has refilled, either Striker can be used again. As the Striker gauge only allows for one Striker to be used when full, you cannot use multiple Strikers at the same time. 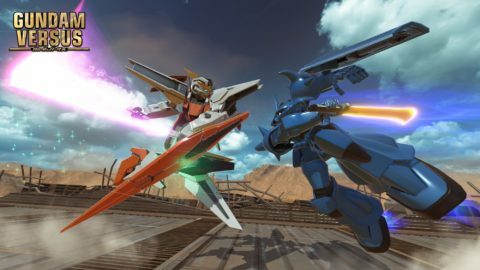 While there were only three to choose from in the alpha test, released screenshots show other Strikers like the Ryusei-Go from Iron Blooded Orphans and Gundam Dynames from 00 Gundam as ones to choose from. 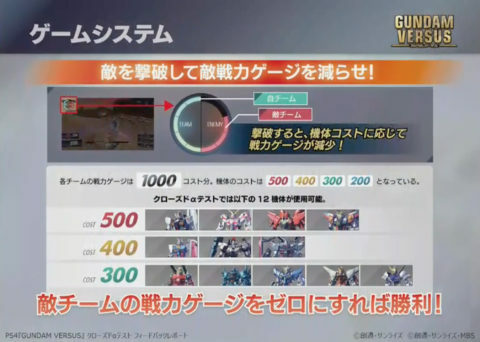 Team costs were also shown during the live stream. While the values have changed, the team gauge mechanic is essentially the same from the previous games. In the second match, you can see Wing Zero get overcosted and come back with significantly lower life as the remaining team cost left did not match its unit cost. There were not 200 cost units in this alpha, but we can only assume this will cost will be relegated to the glorified grunt units like previous VS games. What we’ve seen so far from the alpha test gameplay is very promising as it is definitely staying true to the previous incarnations of the VS series. Feel free to check it out in the video below and let us know what you think! 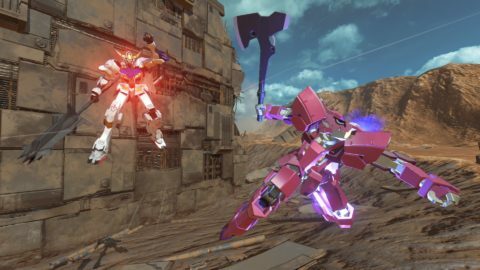 The full report on the Gundam Versus Alpha test has finally been published over at 4gamer, giving us a better picture on what to expect from the latest game in the VS series. We initially talked about early impressions in a previous article, so it’s nice to see confirmation on how the game will be played. There’s definitely an air of familiarity when looking at the main battle screen if you’ve played previous VS games, but there are some nice quality of life changes already apparent. The HUD does not seem as cluttered as before with team health bar taking up a smaller footprint and partner health being more visible than before (an addition made in Maxi Boost ON). Of course, this doesn’t take into account the custom HUDs that can be sometimes pretty garish, but it’s nice to see a cleaner approach. Striker units are also added below the boost gauge. Like the previous EXVS series, the step and boost dash cancels are back. What’s new is the inclusion of the Boost Dive mechanic that allows players to immediately drop towards the floor to improve mobility and defensive maneuverability. It still hasn’t been mentioned how you activate the Boost Dive, but it does work just like step and boost dashes in terms of canceling moves as well. The Striker system is new take on the assists seen in previous games as you are allowed two selectable units in the alpha version. Striker units are also classified as either “shooting” or “fighting” as well, so you have an idea of what kind of assist they’ll provide. As this is only the alpha version, expect more balancing and possibly even more types like a defensive version. In terms of Awakening types, the two that could be chosen were the Blaze Gear and Lightning Gear. The Blaze Gear provided a more short term performance increase whereas the Lightning Gear gave a longer lasting buff with an increased lock-on distance. Both types replenished the boost gauge when activated, but the Lightning Gear also recovered ammo as well. Like previous VS games, the type of Gear used will depend on what unit you select. And as always, activating your Gear will give you access to use your super attack, now known as the Awakening Technique. According to the 4gamer report, the new additions have definitely helped deepen the core gameplay versus earlier versions. Even if you weren’t able to grasp the new Boost Dive and Striker mechanics yet, the you’d still be able to enjoy it due to the familiarity. They were also impressed with the improved graphics and presentation in its early access form. We’re definitely looking forward to hearing how the Gundam Versus team does plan on specializing this particular version for the home market as the alpha test focused primarily on the 2v2 core gameplay the VS series has become well known for. 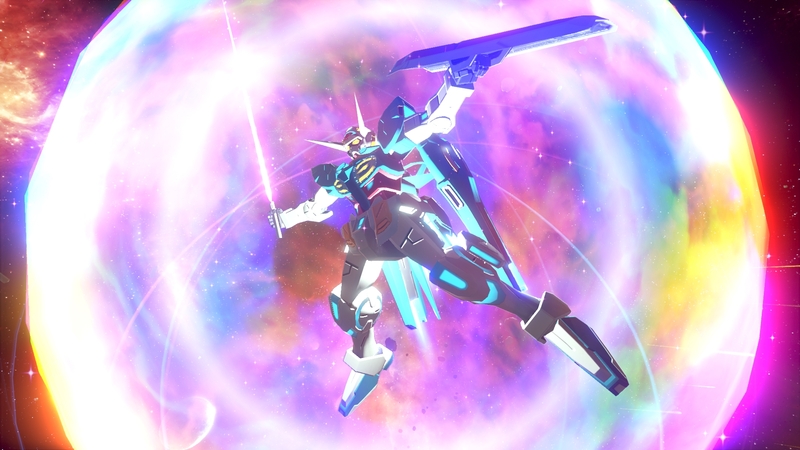 After waiting for what felt like ages, Famitsu has featured new gameplay mechanics and an updated roster from the recent Gundam Versus closed alpha test. 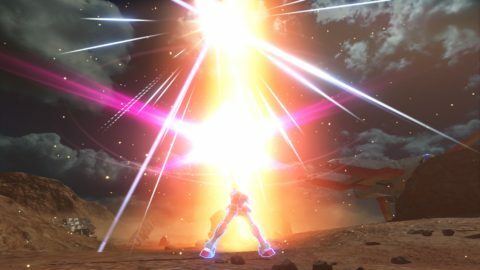 In terms of gameplay, here are some of the following key additions from the article: Boost Dive, Striker System, and Awakening System. 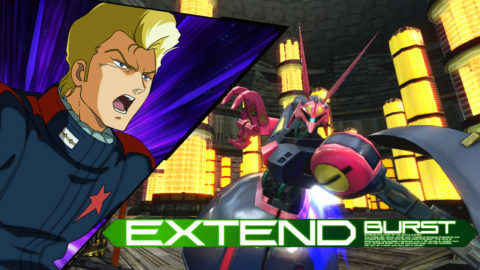 The Boost Dive allows you to fall to the ground very quickly and is activated by cancelling all of your actions.In the previous EXVS series, some units could fast fall via certain cancel routes known in the community as “amekyans.” Considering the verticality of the VS series and how useful amekyans were in terms of mobility and safety for many units, adding a universal fast fall adds a nice new dynamic to the Gundam VS metagame. The Striker System allows you to choose units like Balls and GMs to be called upon during matches as assists. In order to use a Striker, you will activate a Striker gauge that fills during the match. It will be interesting to see if the Striker units may perhaps go beyond the fodder type or will use different amounts of Striker gauges depending on the assist. 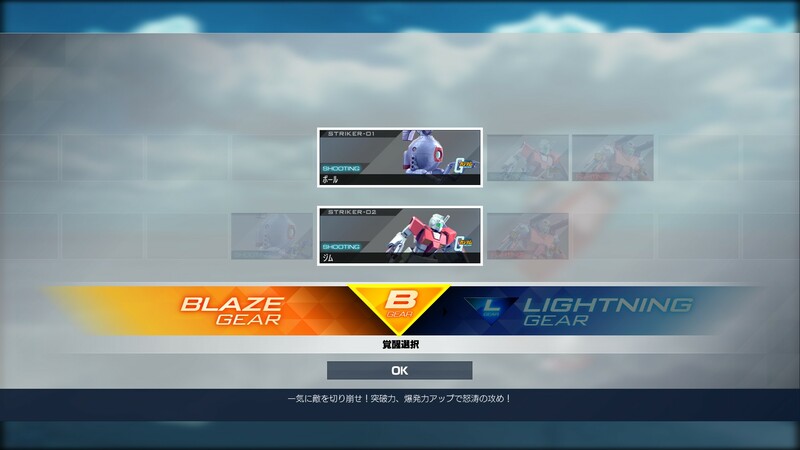 The Awakening System appears to be another evolution of a staple VS mechanic where players could select either the “Blaze” or “Lightning” Gear. The Blaze Gear is an instantaneous-type awakening that improves your melee tracking. The Lightning Gear is a continuous-type awakening that increases your lock-on ability. What’s interesting are the types of awakenings “instantaneous” and “continuous.” First, it sounds like there will be more Gears within these groupings. Second, the naming peaks curiosity into how the boosts will be granted when they’re activated. Are instantaneous Gears short-lived buffs with higher potency whereas continuous Gears provide more measured increases over a longer period of time? 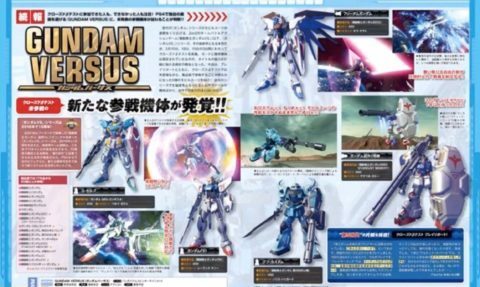 In terms of new units, the following have entered the fray: Tallgeese, Kyrios, Gouf, Guncannon, and Sinanju. This brings the current total roster to 12 joining RX-78-02, Unicorn, Full Armor Gundam (Thunderbolt), Barbatos, Wing Zero, and Nu Gundam. As the article will go on sale on December 15, we hope to learn a lot more about the game’s mechanics on top of how they plan to cater the game more towards a global audience.